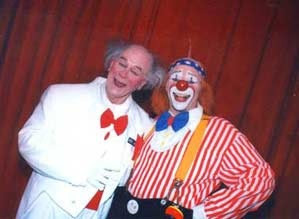 Outside of David Shiner's appearance in Nouvelle Experience my favorite Cirque clowning is that of Russian-born Serguei Chachelev and his Canadian partner Michel Deschamps in La Nouba. Chachelev is very unique in that he has been deaf and mute since childhood. Most performers learn to listen for audience reaction to gauge how well a gag is going over. They adjust the act accordingly. Chachelev simply watches Deschamps for subtle cues. Because so much of clowning is about body language, he sees no reason to call his deafness a disability. 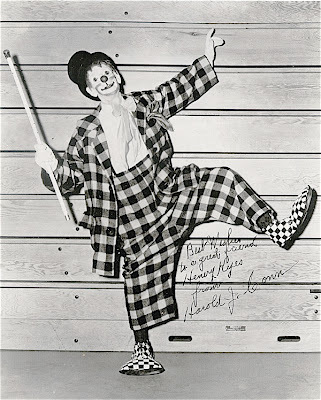 "I was born to be a clown," he signs. 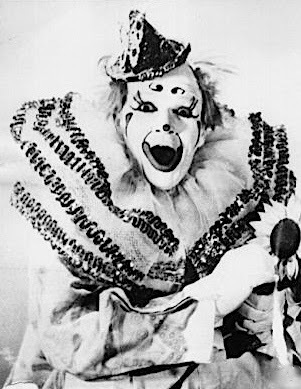 It does feel as though we are coming up on the end of the whole "Angry Clowns/I Hate Clowns/Evil Clowns" era, doesn't it? Jango Edwards in the late 70s on New York City cable access show "If I Can't Dance, You Can Keep Your Revolution". 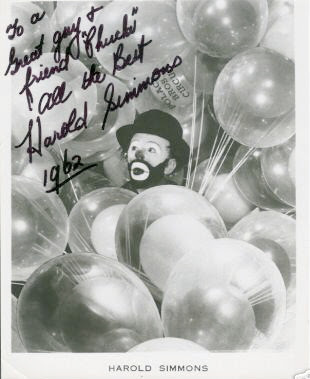 From 1977 through 1995 I was the producer and star of a public access television show that aired in NYC. With a lot of help from my friends, and volunteers we had 18 years of anti-authoritarian television. The show was called, "If I Can't Dance, You Can Keep Your Revolution." It was my intent to have a television version of an underground newspaper, much like the East Village Other, where I had been employed previously. The result was a wonderful mix of guests like Abbie Hoffman, Debbie Harry, Tuli Kupferberg, Michio Kaku, and hundreds of other fabulous people who fit the criteria of being anti-authoritarian. Ms. Crystal is alive and well and living in the Catskills. She has many other clips from her show available on You Tube and she can be reached at cocacrystal@yahoo.com . 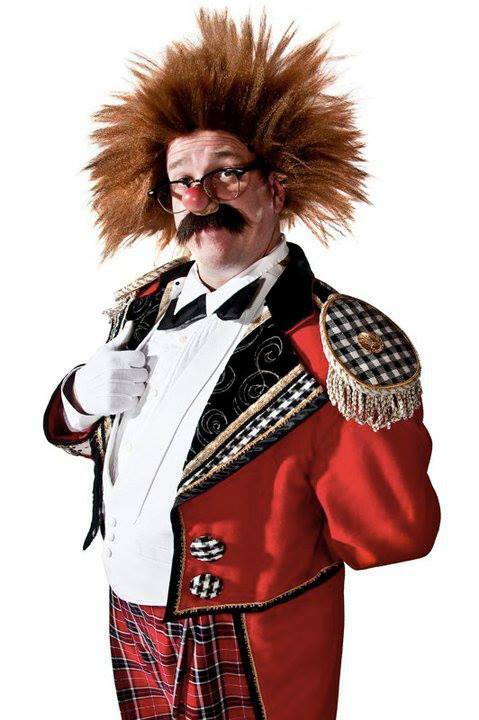 I've just been told that Kirk Marsh (fellow Clown College class of '97 alum) has been invited to compete in the 1st International Circus Festival of Albacete, Spain at the end of February. It'll be his European debut with his own material and he's very excited. 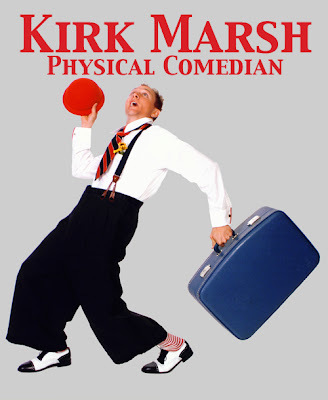 For more info on Kirk, please click the title of this post. Claire Wedemeyer, a very personable and talented young clown, formerly with the Kelly-Miller Circus and Ringling Bros. and Barnum & Bailey. 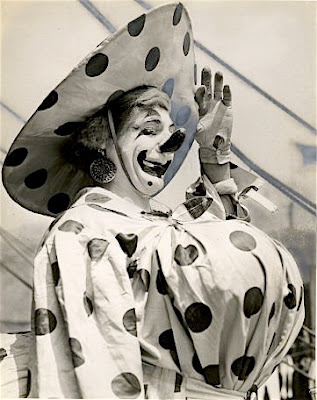 We haven't had a "mystery clown" in awhile. Anyone know who this is? For some reason I want to guess that it's Rudy Dockey but I don't know why. By all accounts, one of the very nicest men who ever lived. 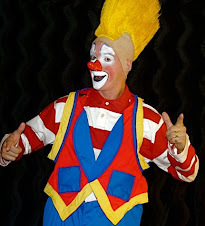 The third of Ringling Bros. and Barnum & Bailey's Master Clowns, Robert "Bobby Kay" Smiley. He is a genius of comedy and has almost put me and several other performers in jail so many times I've lost count...I was surprised when I saw the clip below as they actually featured a little of me performing on that show...He now lives in Spain as he had to flee Amsterdam for reasons I will not go into...This clip doesn't do him justice so I put a second one on this posting to show him at his Best when he is just turned lose on people...He's The man with the million dollar nose Jango Edwards at The festival of fools...Amsterdam..1996. THE NEXT CLIP THEY HAVE TURNED HIM LOSE AT AN SPANISH MOVIE AWARDS CEREMONY IN SPAIN ON SOME OF THE BIGGEST NAMES IN SPANISH TV AND MOVIES...HE IS ALWAYS THIS WAY..NO MATTER WHERE HE IS. Alright, you got me... Chuck is seen here not with his wife Noriko but with his lovely and very beautiful Laughter Unlimited partner, Mr. Jackie LeClaire. 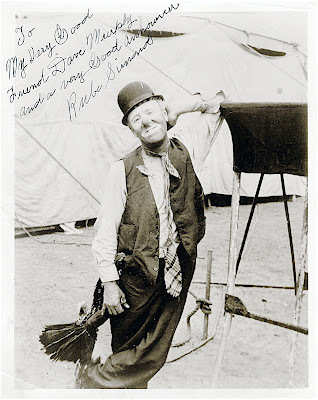 Be that as it may, I spoke with Chuck yesterday and both he and Noriko are doing much better and deeply appreciate the outpouring of affection they have received from the international circus and clown communities. Circus Sarasota opened last Friday to wonderful box office and runs through the 24th before moving to Estero, FL March 11-30th. 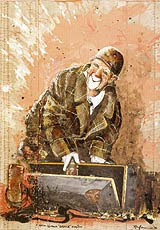 To find out more about the show please click the title of this post. 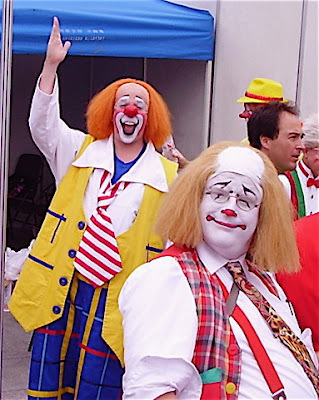 Very happy 29th birthday wishes go out today to my friend and fellow "chinaclown", Michael "Tuba" Heatherton! Rob Torres, a fellow Ringling Clown College grad from New Jersey as well as a fellow Beatty-Cole Advance Clown, rocking the house at the 7th annual Circus Festival in Budapest where he took home the bronze. "Funny Felix" shows why his milkshake brings all the boys to the yard. 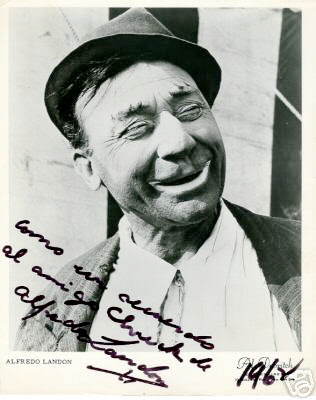 Raffaele de Ritis has posted a very nice piece on Harry Relph, better known as Little Tich, on his blog. Read it by clicking the title of this post. 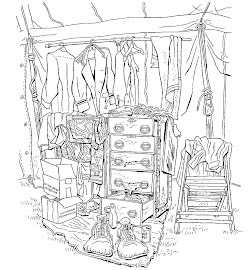 Heartfelt congratulations go out to the cast of Scott and Muriel's BIG SHOW with Joe (Scott Nelson, Muriel Brugman and Clown College alum and former Abbott of Unreason Joe Dieffenbacher) and we look forward to seeing you here in the States soon! Scott & Muriel, the first ever comedy act to win the Grand Prix at the FISM 2000 World Championships of Magic, have now become double prize winners at the 32nd International Circus Festival of Monte Carlo. 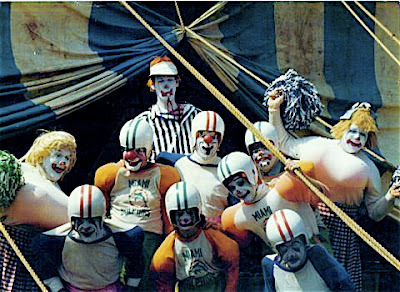 The festival is held every year and is considered the 'Oscars' of the circus world. It was sponsored and presided over by H.S.H. Prince Rainier until his death in 2005 and that role has now passed to H.S.H. Princess Stéphanie. 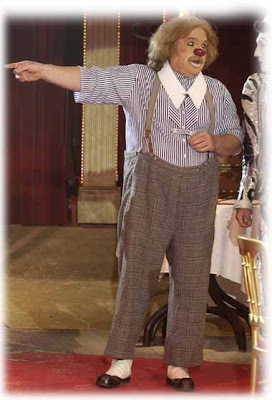 Scott & Muriel were invited to participate after having been seen by the festival director, Mr. Urs Pilz, in the World Christmas Circus in Carré, Amsterdam, in 2004/2005. They are only the 2nd illusionists ever to appear in the festival, the last one being Danish Illusionist Lee Pee Ville some 30 years ago. Scott & Muriel received a standing ovation every time they performed their act, a shortened version of their FISM act done right in the middle of the ring. The standing ovations included H.S.H. Princess Stéphanie, H.S.H. Prince Albert II, the entire jury, and most if not all of the 4500 people in attendance. They were awarded a special prize from the Nice-Matin newspaper in which they had a photo and the quote "Comedy Illusionists Scott & Muriel reinvent the illusion 'Sawing a Woman in Two.'" 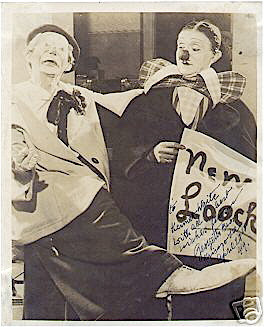 "Not being a traditional circus act" was the reason given by the jury for not awarding Scott & Muriel a 'clown,' (the prizes that are awarded by the jury.) 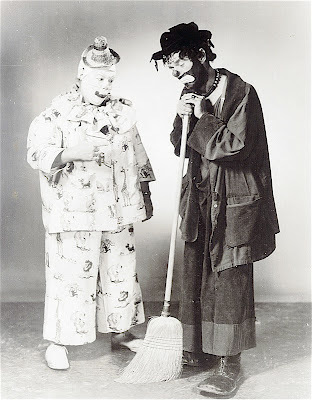 They were the only act to receive a standing ovation for every performance that did not receive a clown. 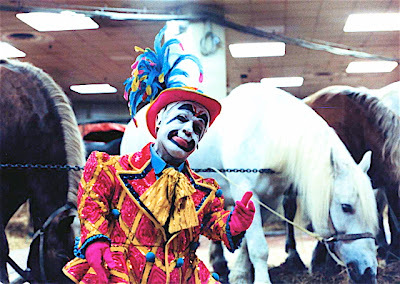 They have since received offers for a two year contract with Ringling Bros. in America, the Big Apple Circus in New York, and from circuses from most of the countries in Europe and even South America. Scott & Muriel continue to tour their own full evening theater show 'Scott & Muriel's B!G Show with Joe' throughout Europe. Negotiations are under way to bring the entire show to Monte Carlo next season. Scott & Muriel first performed together in Monte Carlo in the famous Magic Stars Festival in 1999. Only their third contract, they did not win an award. However it was at this festival that they got engaged backstage in the beautiful Theater Princess Grace. Ten months later they would go on to win the World Championships in Lisbon, Portugal. "Monte Carlo has a very special place in our hearts and it was a thrill to be back and be asked to take part in such a prestigious event" said the couple. Participation is by invitation only with all acts being approved by H.S.H. Princess Stéphanie. For more info on Scott and Muriel's BIG SHOW with Joe, please click the title of this post. 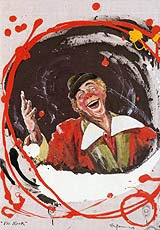 A very nice segment from the program SHOWROOM, which shows members of the International Circus Clowns Club attending the annual mass in honor of Joseph Grimaldi at Holy Trinity Church in East London. 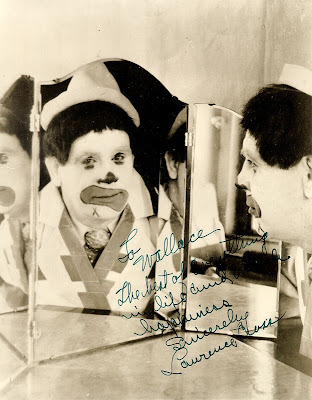 Love and sincere gratitude always from this argentine-canadian clown, Marcelo PEPPO Melison. 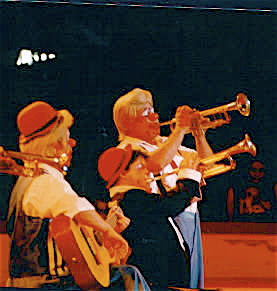 At the urging of Mr. Mike Naughton of the Yankee Doodle Circus here is the Tony Alexis Family as seen of Circus Benneweis in 2002. Does anyone know if there is any video of the act circulating? 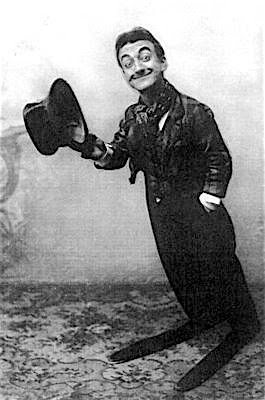 Bernhard Paul created his Zippo clown character in 1976. 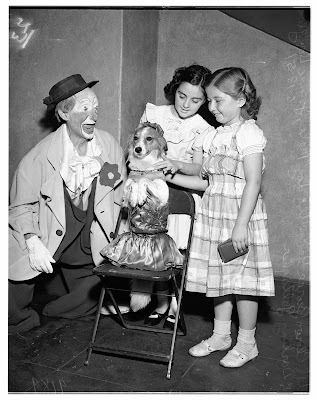 It is interesting to remark how often in clown history a combination of shoes, shirt, neck, make-up, nose, even suspenders can meet incredible coincidences. 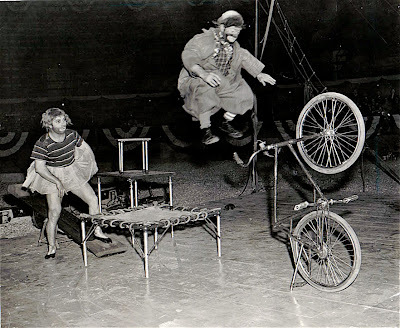 Will and Bobby Morris at the Kansas City Police Circus May 4, 1943. I'm wondering just where it is that Bobby lands as there is no seat on that bicycle. Enjoy the game and remember, it's not important whether or not the Giants win.